The world is obsessed with drones, and 2015 has propelled them to the next level. They went from being this freak thing in the sky to something you can't escape. Everywhere you see, there are drones. From photography to wedding videography, and now to the Drone Racing League, there's no doubt: drones are our new tech obsession. 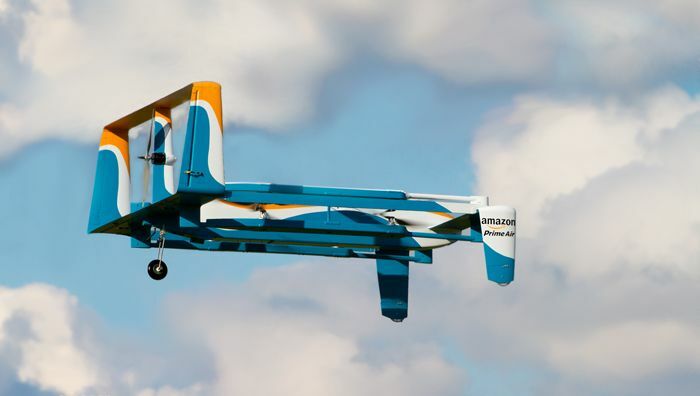 The latest to jump on the drones bandwagon is e-commerce giant, Amazon. Essentially, they want to cut out the middleman and deliver your product via a drone. Also read: The Drone Racing League just raised $1 million. Is this the world's next sport obsession? It's not like Amazon just came up with the idea. Back in December 2013, Amazon CEO Jeff Bezos went on 60 Minutes and had a big surprise for host Charlie Rose. He announced that Amazon was working on delivery that was even faster than their Prime service. Called Prime Air, the new service would use unmanned aerial vehicles - or simply drones - and deliver your order within half an hour. Back then, Bezos said that these 'octocopters' weren't ready to take flight yet and that this idea would take flight in four to five years. Almost two years to the date, Amazon has brought its very own high-profile celebrity, TV icon and former Top Gear host Jeremy Clarkson to introduce version 2.0 of its 'octocopters'. Clarkson's association with Amazon isn't news by itself - back in July, the corporation signed on all three former hosts of Top Gear for a new unnamed motoring show to premiere on Amazon Prime in 2016. But Clarkson in a drone ad? Now that's new(s). In a sleek new ad + FAQ page published on 29 November, the company demo'ed the latest version of Prime Air and what a delivery would look like should regulators approve deliveries by unmanned aerial vehicle. The first question on the FAQ reads, "Is this science fiction or is this real?" The answer: "It looks like science fiction, but it's real. One day, seeing Prime Air vehicles will be as normal as seeing mail trucks on the road." The ad shows Clarkson reciting a story from the not-too-distant future. The family's daughter has a big football match. But there's one problem: she's missing a size 3 Puma Evo power firm ground soccer shoe, the left one. Some of which is being chewed on by the family's 3-year-old bulldog. Enter tech-savvy mom, who immediately places an order via her tablet for delivery within 30 minutes. Cut to a shot of the drone, rising vertically like a helicopter to nearly 400 ft above factory height. The hybrid design allows it to assume horizontal proportions and become a streamlined and fast 'airplane'. This custom-designed drone can fly for up to 15 miles and "knows what is happening around it. It uses sense-and-avoid technology to, well, sense and then avoid obstacles on the ground and in the air." Once it arrives at the destination, the drone scans the area and looks for a suitable landing spot. This is unlike the previous design of the drone where packages had to be manually carried and loaded on to it. In the future, "there will be a whole family of Amazon drones. Different designs for different environments." "We are testing many different vehicle designs and delivery mechanisms to discover how best to deliver packages in a variety of environments. We have more than a dozen prototypes that we've developed in our research and development labs. The look and characteristics of the vehicles will evolve over time," reads an answer on the FAQ. 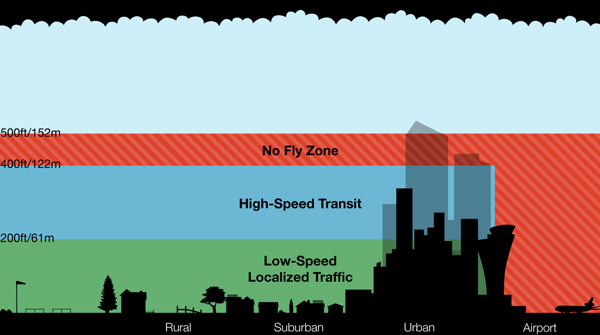 Amazon is proposing something similar to Google and NASA - they're calling for a slow traffic lane below 200 ft and a fast lane for long-distance transport between 200 and 400 ft. From 400 to 500 ft would be a no fly zone. Anything above that is currently out of bounds for hobbyists. At the moment, the US' Federal Aviation Administration (FAA) doesn't allow the usage of drones for delivery. Amazon is pushing the FAA to allow it to deliver packages weighing under five pounds and to houses no further than 10-15 miles from its warehouses. Others are pushing the FAA to allow them to fly drones for commercial purposes above 500 ft but for the moment, Amazon is not interested in that conversation. For now, they're only intent on getting approval and starting drone deliveries. 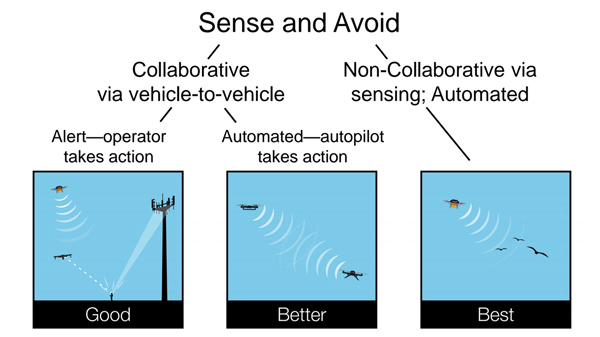 In their present iteration, the drones would work better in a more rural or suburban area than urban ones (with their highrise buildings and tendency to shoot down drones). In recent times, retailing has saturated and companies are thinking out of the box to squeeze out those few extra dollars from every customer. Ultra-fast delivery is one way to do that and by flying in the air, they could avoid the biggest delay of all, traffic. We're thinking unboxing videos could be made a whole lot cooler if Amazon were to include one extra feature - GoPros mounted to the top of the drones that capture the delivery that's released to the customer once the drone is back at base. Fortunately, since these deliveries are still a couple of years away, we're hoping Amazon clues in before then. Till then, watch this space to see whether your shopping's going to be taking wing anytime soon. Copyright versus wrong: who's really to blame for illegal music downloads?